Following the smashing success of Batman, Tim Burton was given more creative freedom in the sequel. Batman Returns has good acting and great visuals, but Burton infused a little too much of his own style, resulting in a film that, reportedly, caused many children expecting a normal action film to come out of the theaters crying. For its faults, it has a pretty strong cast, with Danny Devito as an odd mutant take on the Penguin, Michelle Pfeiffer as Catwoman, and Christopher Walken being awesome as always as evil business and power mogul Max Schreck. Among the Burton tropes in Batman Returns are a circus, plenty of pale faces, gothic designs, and a dark Danny Elfman score. The score is quite different from the first, which is more traditionally heroic. Its emphasis is on bleak darkness, as represented by its two new, liberally quoted themes. Both are sinister, but with a strong hint of tragedy. The Penguin’s theme debuts in “Birth of a Penguin” and gets extensive treatment in “The Lair” and “The Cemetery”. It’s used so often that how much you like the theme will effect how you feel about the whole album. Catwoman’s theme has two parts. The first is high-pitched strings representing the feline meowing and screeching of a cat. The second part is a more tragic motif that dominates the more sweeping portions of “Selina Transforms”. Christopher Walken’s character doesn’t get a theme despite his prominent relevance to both Penguin and Catwoman. The Batman theme itself takes a much more subdued role. Whereas the 1989 film had plenty of lengthy, heroic iterations, this one sees smaller references, often without any of the heroic brass. There is an amazing version for the opening titles, with a dark choir lending some extra gravitas and atmosphere. “Birth of a Penguin” opens with a short, low snippet of the Batman theme before an oohing choir and an organ introduce the Penguin’s theme. The track climaxes with Elfman’s familiar “la-la” choral work to represent the film’s Christmas surroundings before “Opening Titles” takes over. The Penguin and Catwoman themes get lengthy treatments for the next few tracks, which can get tiring at points. “Batman vs. the Circus” is the first moment in the score where the hero’s theme plays out in any major way. This track starts off with a great build into the Batman theme. The rest of it is Batman’s theme battling circus music. Tracks 10 and 11 contrast two moments for the Penguin’s character. “The Rise…” starts off sinisterly, but ends with a triumphant fanfare, while “…And Fall From Grace” ends with a very tragic rendition of the Penguin’s theme. There is no love theme this time around, since the main female interest is Selina Kyle/Catwoman, who already has plenty of her own thematic material. 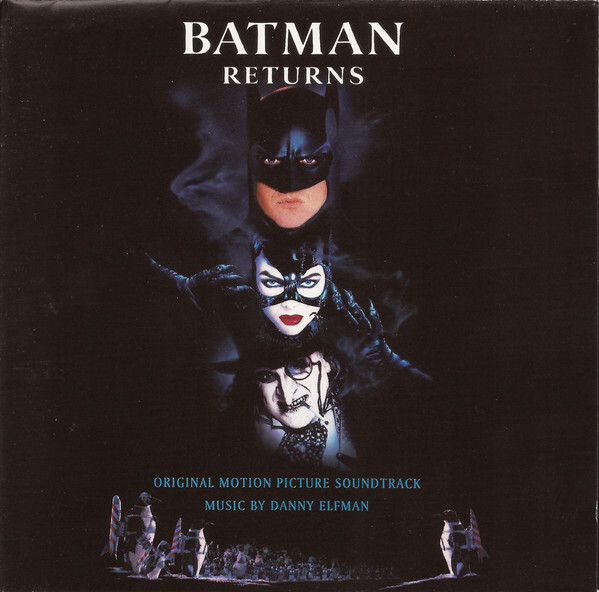 Elfman still delivers a twisted romance track, “Sore Spots”, which plays out like an old-time Hollywood love theme, but keeps getting intruded on by Catwoman’s high-pitched strings. “Rooftops” moves between different tempos, starting off with more carnivalesque action music, going into dark villain territory, a choral outburst of the Batman theme, some sinister choral material, and then a few violin screeches. “Wild Chase” is another action cue where Batman’s theme battles circus music. “The Children’s Hour” is features the Penguin’s theme as a lullaby. “The Final Confrontation” kicks off with a military drumbeat. The rest of the track see the Batman and Penguin themes duke it out. “Penguin Army” (this and the next track are misnamed), sees the climax while “Selina’s Electrocution” gives the Penguin a tragic send-off. “Finale” is interesting in how it contracts with the same-named cue from the previous score. While that one was heroic and uplifting, with Batman rising to save the city, this one is unclear, tragic, and somber. The end credits suite sees all three major themes get a last play. The album features sixty-five minutes of score and a song by some early nineties guys called the Banshees at the end entitled “Face to Face”. In a very perplexing move, the track titles are listed only on the CD, with many of the tracks renamed to fit on it! This almost takes away a point from the soundtrack merely just for giving the listener confusion about what piece of music he is listening to unless if he’s heard it while watching the film. Thankfully, the proper track listing can be found online at several places, though even then most of the last tracks are misnamed (For example, the Penguin’s somber farewell is called “Selina’s Electrocution”). There’s also a complete score release, but aside from a couple more references to the less used Batman theme, I can’t think of anything that the original album doesn’t already have. Batman Returns is not the exciting, dark yet heroic thrill ride its predecessor was, both in film and score. The music is much more Burtonish, but this doesn’t make it bad. The new themes are strong and any faults with Elfman’s score can be chalked up to the more weird and dark atmosphere of the film. As I stated earlier, one’s opinion of the new themes can determine an opinion of the overall product. I think they’re good and encompass a wide variety of emotions with ease. The action music isn’t as good here, maybe because of all the circus and carnival material, but I think “Final Confrontation” is a great dramatic build to the film’s climax. Overall, Elfman’s Returns is a very different score, but a good one.